Powers/Abilities: The Kronans' bodies are composed of a strong, silicon like substance, granting them proteciton against physical harm. Within an oxygen-based atmosphere, they possess enhanced strength. They can consume minerals such as coal or shale as food. Kronans reproduce by holding hands and immersing them within a pool of lava (traditionally Mount Krona on the homeworld); after days of merging and hardening, the hands break apart, releasing the newborn "rockling." It is unclear whether there are female Kronans. They are a highly advanced race, having built vehicles capable of space travel, and designed robots such as the Mechano-Monster and Mekkanoid. Once, a Kronan made use of the Gravitron aboard his ship as a weapon. They also possess technology which can create illusions, such as that of a fire-breathing dragon. History: (Captain America Annual#11 (fb) ) - Around 3,000 BC, the Kronans attempted an invasion of earth. Landing in ancient Babylon, they fought King Gilgamesh of Uruk, who vanquished them with the aid of a time-travelling Captain America. The Kronans fled to their vessel and abandoned earth. (Journey Into Mystery I#83)- In modern times, the Kronans landed an immense invasion force in Norway. Sighted by Dr. Donald Blake, they pursued him into a cave, where Blake discovered the hammer of Thor. The Kronans went on to attack NATO forces, driving them off with an illusionary dragon. When Thor came to fight them, they lowered a cage over him to capture him, but he smashed through. They aimed their disintegrators at him, but he smashed them with his hammer. Finally, they unleashed the Mechano-Monster, but Thor destroyed it with a single blow. Terrified of Thor, the Kronans fled earth. (Thor I#255)- One of the escaping Kronan vessels crashed into an asteroid and became stranded in space. When Thor, Sif, and the Warriors Three visited the site of their crash in their vessel the Star-Jammer, the Kronans attacked them in the hopes of stealing the Star-Jammer. Unable to match them in power, one of the Kronans removed the Gravitron from their ship and modified it into a weapon to fall Thor and his allies. However, Thor fought against the ray, and destroyed it. He then destroyed the Kronans' vessel, setting off a chain reaction which set about destroying the entire asteroid. The Star-Jammer lifted off the asteroid, abandoning the Kronans to their deaths. (Avengers Spotlight#25/2)- The Kronans were among the alien races which attempted to negotiate for the rights to Rick Jones' biography, "Sidekick." When they learnt it did not reveal how he had tapped the Destiny Force during the Kree-Skrull War, they withdrew their bid. 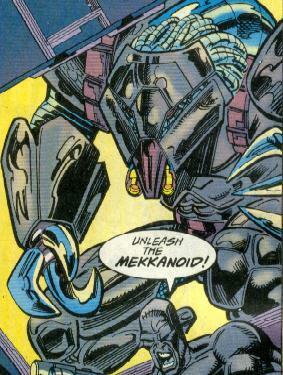 (Starblast#1-2, Quasar#55)- Zardok served as a member of the Starblasters. In battle with heroes from earth, he was slain by Perun. (Thor I#482)- A band of Kronans allied themselves with the New Immortals, and were sent by them to earth to oppose the High Evolutionary and his allies, the God Pack. They attacked the High Evolutionary's forces at Mount Wundagore, but found themselves again facing Thor. They unleashed their Mekkanoid against them, but it was destroyed by Anak. They also created another illusionary dragon, but it was dispelled by Luminor. The Kronans were all defeated, with one slain by Thor in battle. The others were taken prisoner by the High Evolutionary, who learnt from them that the New Immortals were their masters. (Incredible Hulk III#93) - A number of Kronans, including Korg and Margus, became prisoners on the planet Sakaar, where they became gladiators. Margus and the other Kronans resisted their implants, and lost their minds. Korg wound up having to fight Margus and the others alongside his fellow gladiators the Hulk, Miek, Elloe, Lavin Skee, a Shadow, and a Brood. (Incredible Hulk III#94) - Korg recalled how he and Margus had been a part of the forces that fought Thor in Norway. He and the other gladiators became "warbound," pledging allegiance to each other. (Giant-Size Hulk II#1/Incredible Hulk III#95-105/World War Hulk Prologue: World Breaker#1) - Korg continued to adventure with the Warbound as they broke free from the arenas and began to roam Sakaar, leading their own army, and eventually raising up an army against the Red King that overthrew him. Korg helped convince the Hulk that he should become the new ruler of Sakaar. The Hulk took Caiera as his queen, but when the vessel which brought him to Sakaar suddenly exploded, it slew most of the planet's population, Caiera included. The Warbound gathered the survivors, and the Hulk led them to Earth so that he could seek vengeance. (World War Hulk#1-5/Incredible Hulk II#107, 109-110/Avengers: The Initiative#4-5/World War Hulk: X-Men#3) - Korg accompanied the Warbound to Earth as they began their confrontation with the planet's heroes, but the battle ultimately ended with the revelation of Miek's involvement in the destruction of Sakaar. (World War Hulk: Aftersmash#1, World War Hulk: Aftersmash - Warbound#1-5) - Korg and the other Warbound became fugitives on Earth after the Hulk's defeat, and went on the run from S.H.I.E.L.D. Comments: Created by Stan Lee, Larry Lieber, Jack Kirby and Joe Sinnott. The Kronans appearance in Thor I#482 was meant to celebrate 400 issues of Thor since his first appearance in Journey Into Mystery I#83. In the Gilgamesh myth, the Stone Men (Kronans) were needed for Gilgamesh to cross the River of Death, but he destroyed them in a fit of rage. 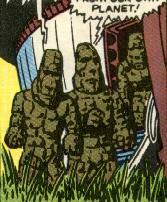 The Kronans were the latest in a long line of stone men Jack Kirby had designed. 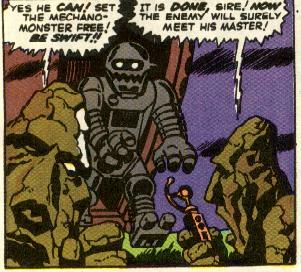 This article from the Jack Kirby Collector discusses the other Stone Men at length. With respect to the Things from Easter Island discussed in that article, Carycomix adds: "Given the new synopsis (stating that they were scouts for some kind of extraterrestrial invasion force), I am more positive than ever that they could be retconned as Kronans. Pre-Thor, of course." In Galacta: Daughter of Galactus#1, Galacta consumed a group of Kronans who sought to reproduce through Earth's rocks. I would not think the character and stories in Galacta are part of Reality-616, but that has yet to be definitively confirmed anywhere. The Kronans received an entry in the All-New Official Handbook of the Marvel Universe Update#2.